To get to your Salesforce account, open Internet Explorer, Firefox, or Safari, and then log in to Salesforce at http://login.salesforce.com. You might have previously organized your information in spreadsheets. 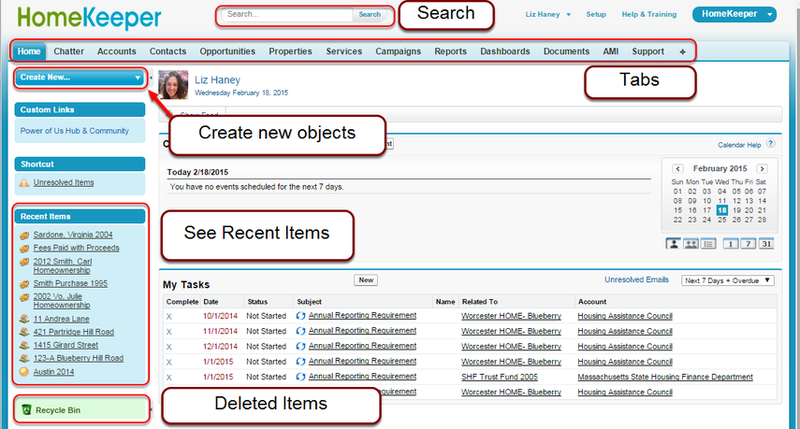 When using Salesforce, your information will be organized into "objects" and "records". 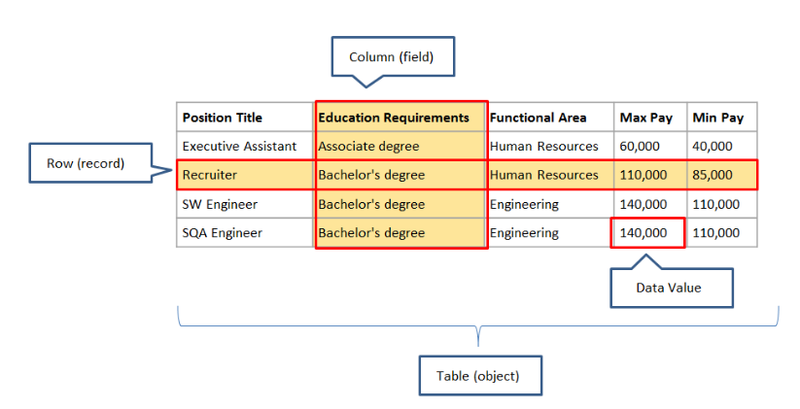 Objects are similar to tabs or tables on a spreadsheet. Rows are similar to a single row of spreadsheet data. Your home page shows your personal calendar, tasks that are assigned to you and items waiting for your approval. Located at the top is a powerful Search tool which will look for any occurrence your search term throughout HomeKeeper. Recycle Bin is where items you have recently deleted are placed for 15 days (then, permanently deleted automatically). 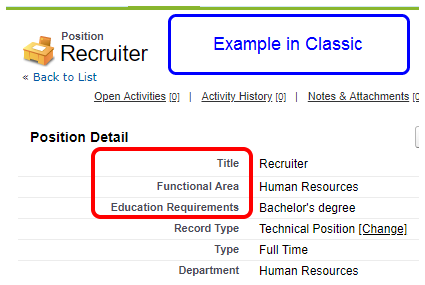 Salesforce organizes data on tabs, each of which represents a type of “object” in Salesforce. The tabs that you see depend on the permissions defined in your user profile, as well as any additional custom objects that we may have created for your organization. This object holds all of the organizations that we work with regularly. Ex. Lenders, Law Offices, etc. This object holds all the individuals. Ex. Loan Officers, attorneys, homeowners, applicants, etc. This is where all the information on your properties is held. This object is where you'll will spend most of your time. This is where all transaction details about a household will be held: from application information to closing date to resale, as well as any steps in between. This object is where all the reports are generated. A Dashboard is basically a report in visual form. Ex. Pie charts, graphs, etc. This is where common document templates will be held. This object holds the median income value for a year. You'll create one for every year and MSA (geographic area) you qualified clients. A User can go to this object for a quick reference to the ZenDesk Support site. To look up property information or information on a individual, you use the Search bar along the top of the screen. Use an asterisk (*) to get a wider search result This will bring up anything that begins with what you typed in. For example: instead of typing “Jaclyn Marcotte”, type “Jacly*”. This will bring up any record that starts with Jacly. 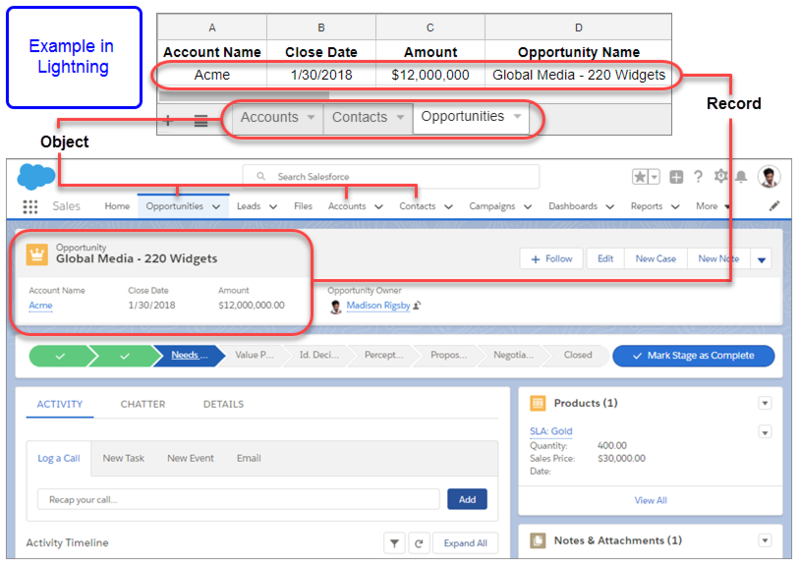 Before you create a new record in Salesforce, always search first. This will help make sure you don’t miss a record that has already been created. HomeKeeper will pull records from all objects in your search. Above, we typed in "smi*" and found Services, Contacts, and Accounts that all include that text.